Sunday, we left Bird Park outside Harare at 5:45 in the morning, and five hours later we arrived at the Great Zimbabwe Ruins near Masvingo. 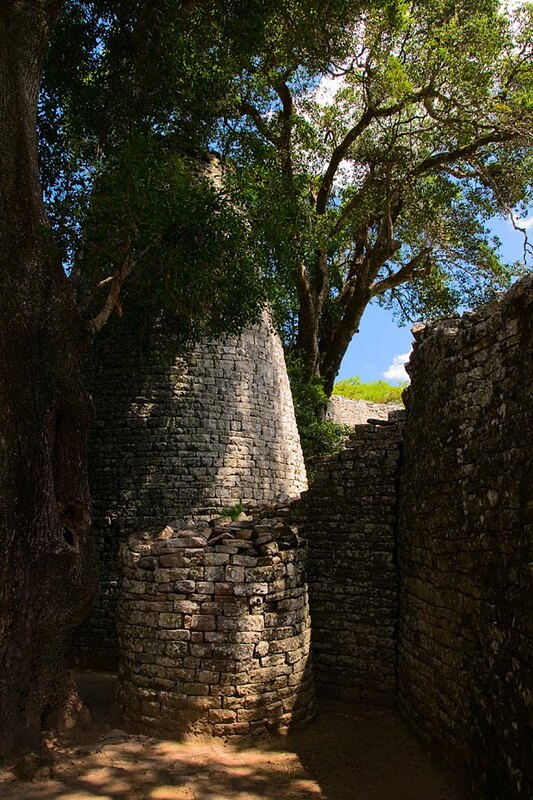 The vast complex of stone walls is probably the most significant archaeological site in sub-Saharan Africa. 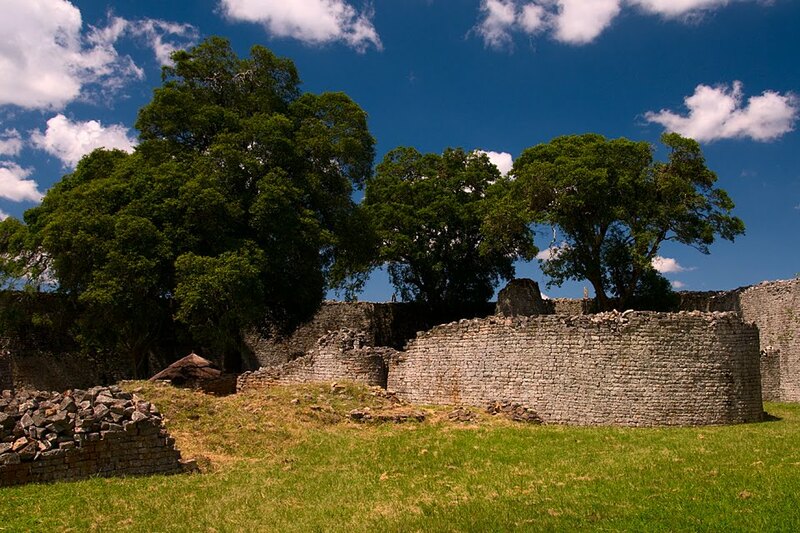 The central circular structure, the Great Enclosure, is an impressive example of precolonial stone work. The dominant feature is a conical tower whose exact purpose is uncertain, and the enclosure's tall, curving walls create several narrow passageways. There is also a museum at the site that explains the history of the ruins and contains several bird carvings found among the stones – one of these birds has become the symbol of Zimbabwe and is featured on the nation's flag. After lunch, we made our way to Gweru in the center of the country, four hours away. Our destination was Antelope Park, a premier wildlife park dedicated to returning the threatened African lion to natural habitats throughout the continent. The park will actually be featured in a new British television series called "Lion Country", which will hopefully bring attention to the plight of lions – the number of the cats in the wild has diminished dramatically in the last few decades, a result of poaching, encroaching urban communities, and many other factors. Antelope Park, like Bird Park near Harare, has had to fight passionately to accumulate enough land to carry out its mission. 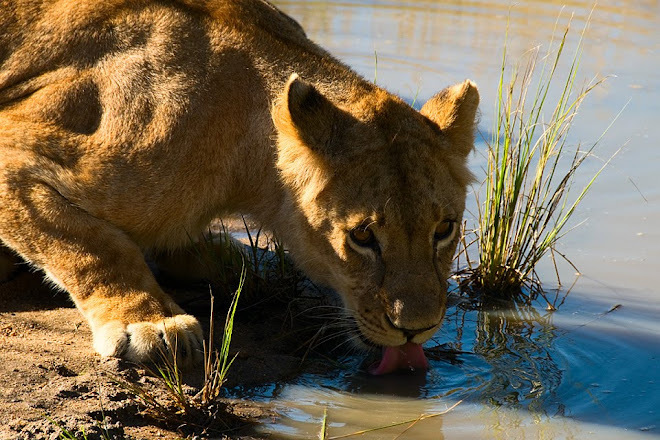 As the government bureaucracy in Zimbabwe presents major obstacles, other African countries such as Zambia, Mozambique, and Ghana have expressed interest in establishing sister parks to help reintroduce lions into the wild. It is a multi-generational process: specialists at Antelope Park will help cubs develop their instinctive hunting skills, and once those lions reach maturity, they will be bred. The resulting cubs will learn how to hunt and survive from their parents rather than humans, and they will then be released into the wild. During our four-night stay, Antelope Park offered us a unique chance to witness the different stages of their mission, and to get up close and personal with the lions. Monday was a pretty relaxing day. In the late morning, we took the truck into town for a few hours so we could eat lunch and go to the supermarket. Then we enjoyed the atmosphere of Antelope Park for the rest of the day. It is the nicest campsite we have stayed at – a picturesque, slow-moving river lazily flows past the camping area, the staff are genuinely the friendliest we have met, and the dining area offers free tea, coffee, and juice all day long. 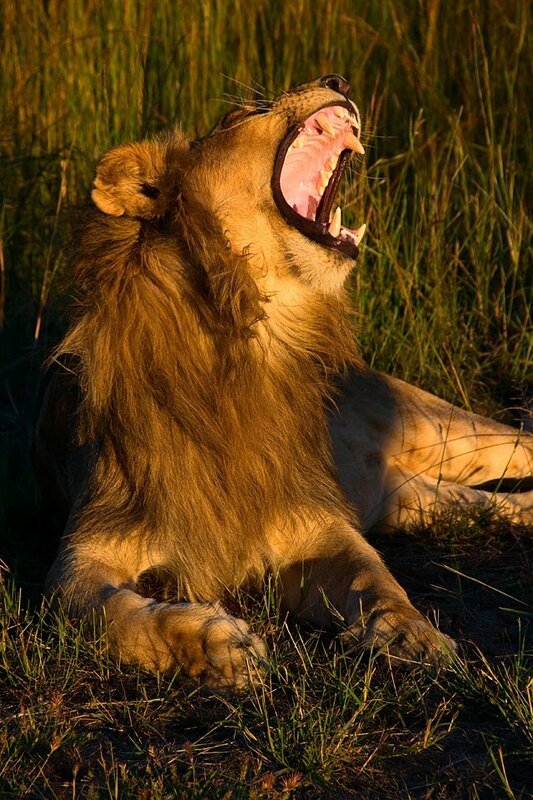 A lion yawns in Antelope Park near Gweru, Zimbabwe. In the evening, I set out for my first activity with the lions, a night encounter. I climbed into an open top truck with several other visitors and a few lion trainers, and we sped down the dirt road outside the camp gates. We soon arrived at one of the lion enclosures, and the trainers opened the gate and released three of the lions. We continued to bump along the rough road, this time with three lions walking alongside the open sides of the truck. If they had wanted to, the lions could easily have leaped into the vehicle with us, but these lions were well behaved. The objective of the night was to assist the lions in making a kill. 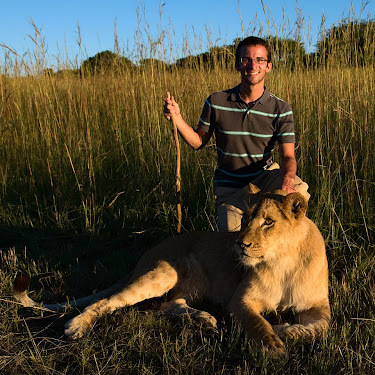 One of the trainers controlled a large red light, and when prey such as impala was spotted, he would shine the light on the unfortunate animal, guiding the lions without disturbing their night vision. This activity hones the lions' hunting skills so that once they breed they can teach their cubs to hunt more effectively. Among the trees, two scarlet orbs reflected in the beam of light – we had found a target for the cats. It was a giraffe – surely too large for lions who were learning to hunt. But our lions must have been hungry, and a chase began. The driver accelerated and we raced across the rugged terrain as the lions charged at full speed towards the giraffe. Giraffes can run unbelievably fast, as it turns out, and the lions tired quickly during the chase. We had to search for easier prey. Soon we passed two more giraffes, one of them a baby. One of the lions must have had her mind set on giraffe, because she initiated another chase, this time directly down the road. All of a sudden, a herd of startled zebras darted across the road directly in front of us and disrupted the chase. The baby giraffe was safe. As exciting as it would be to see the lions take down a giraffe, it is dangerous prey – a giraffe can kill a lion with one powerful kick. As the evening wore on, we illuminated numerous impalas with the red beam, but none of the chases were successful. One of the guides explained that the full moon, although it made it easier for us to see the chases, also allowed the prey to see their hunters more easily. Every time, as the lions stalked quietly through the grass, the targeted impala made a loud warning sound and bounded off into the darkness. Although the lions returned to their enclosure hungry, it was fascinating to witness firsthand their stealthy hunting technique. After returning to camp and eating a cold, left-over dinner, I fell asleep to the splashing of water birds (or crocodiles?!) only feet from my tent, accompanied by the echoing, ghostly roar of distant lions. Yesterday was packed with activities. First thing in the morning, I walked with lions. The walk was similar to the one near Harare, but this time featured much larger twenty-month-old lions who had already made some kills. The dawn lighting was also much better for photography than the previous dusk walk, and I was able to pose with the majestic cats. When posing for photos, we had to approach the lions from behind and were not allowed to pet them on the face or ears. The lions have been conditioned to view people on their walks as older, taller members of their pride, not other animals or humans. However, if you take an action that might make you seem inferior (such as crouching down), a lion may pounce. This is not malicious, but rather a playful act of asserting dominance. Lions wrestle with other members of their pride, but a twenty-month-old lion wrestling with a human could be deadly. To further protect ourselves, we carried sticks – not to beat a misbehaving lion, but to distract them by dragging the stick back and forth through the dirt. Lions, just like domestic house cats, quickly lose focus and are attracted to the nearest interesting object. As soon as I returned back to camp, I set out for the horse stables for a horseback safari through the park. We all picked our horses and mounted – but mine didn't want to cooperate. The other horses automatically walked towards the trail we would be taking, but mine just walked back into the stable and stood there! No command would convince my horse to budge, so I asked for a second horse. This one seemed acceptable at first but soon made its way to the front of the line, ahead of our guide. The guide said that my horse was a natural leader – not exactly what I wanted to hear considering this was my first time ever riding a horse. As we began the trail, something startled my horse and it sort of bucked – luckily I stayed on, but it scared the crap out of me and I demanded yet another horse. After two duds, the third one was a charm. It was a calm, normal horse who stayed near the back of the line and kept eating a lot of grass. Once I became more comfortable controlling the reins, I learned how to make my horse trot by kicking it gently in the ribs. The horses walked for most of the trail, but whenever I fell too far towards the back of the line, I gave a gentle kick. We saw a few animals, mostly various antelopes, and by the time we were heading back to the stables, I felt a bit more natural. At one point, there was some standing water in a dip between two hills, and it was great fun to give my horse a kick and splash through the water up the other side of the hill. Still, a trot was plenty fast enough for me. After eating lunch and relaxing with some free tea in the camp's shaded dining area, I walked over to an enclosure that contained a few lion cubs. A guide let us inside the enclosure, and we were able to play with the cubs for a while, rolling them over and patting their bellies. One of the cubs is apparently not fond of people, and he growled and backed off whenever someone approached him. The other two cubs were personable, but even they became grouchy after spending too much time with us. We left the cubs and then took a vehicle out to the large lion enclosures for feeding time. As we approached the fence, the stench of a decaying cow carcass became overpowering, and the buzzing of hundreds of flies grew louder. We crouched down by the carcass and waited for the gate to open – then, from the far corner of the enclosure, several massive adult lions charged at full speed towards the meat, skidding into it and sending blood and flies spraying through the air. They ripped the carcass to shreds and then each took a piece of the meat gnawed it to the bone like dogs. I had one more lion walk before dinner, but the cats were lazier than they were on the morning walk. Still, I couldn't help but think about the lion feeding and the ferocious, pent-up power within these imposing beasts. After dinner, I encountered another of Africa's most impressive creatures: the elephant. It was an elephant-back safari, illuminated only by the glow of the full moon. There were four elephants, and two people plus a guide rode on each animal. Nix and I shared a 23-year-old elephant, and we clumsily climbed onto the leathery creature from an elevated wooden platform. I sat in the back, all too conscious of the animal's hip bones shifting back and forth like pistons underneath the thin blanket on which we sat. Halfway through the walk, our elephant suddenly ran into the trees off the side of the path, and I thrust my arms around both Nix and our guide as we nearly slid off the beast. The elephant behind then charged us, its tusk nearly missing my foot. After the animals calmed down, our guide explained that the two elephants don't like each other. So we continued the walk, this time with our arms in a death grip around our guide's waist. At the end of the walk, we dismounted onto the wooden platform and carefully descended the ladder-like "stairs" constructed of horizontal tree branches. Back on solid ground, I realized that I could hardly stand, as my legs had been so widely spread while straddling the massive creature. 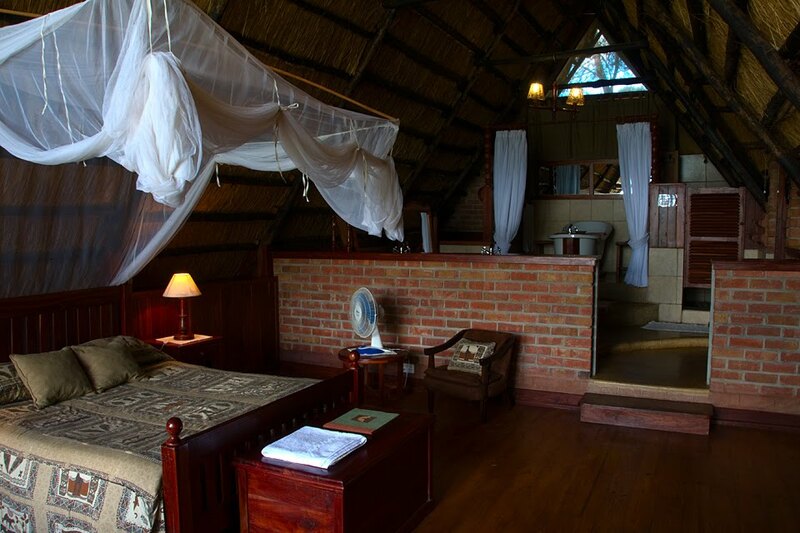 I had an excellent night's sleep, as Tom and I upgraded to an A-frame lodge for the last two nights at Antelope Park. It was $20 per night, but it was the best upgrade of the trip so far. Today I did absolutely nothing except take a much-anticipated bath in the luxurious tub, lounge around the cabin, and gaze at the calm river flowing by the windows. You've never been on a horse before? !